In the last few years, the popularity of digital trail or wildlife cameras has exploded. These cameras are often used by hunters, but they are also popular with wildlife enthusiasts who enjoy seeing what visits their backyard at night. There are now dozens and dozens of makes and models available everywhere from Walmart.com or Amazon.com to higher-end hunting and sporting goods stores. If you have lost a shy, elusive dog try to beg, borrow or buy a trail camera. You may have a friend that has one that will let you borrow it or you may have to purchase one – but they are now readily available for less than $100, sometimes as low as $60 if you happen to catch a sale. The pictures on this page were taken with very inexpensive models that have been generously donated to our organization. 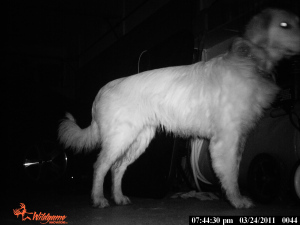 You aren’t looking for gallery quality photos – you just want to see if it is your dog that is eating the food, and what time of day he was there. Insert fresh batteries in the camera, and a blank SD card. 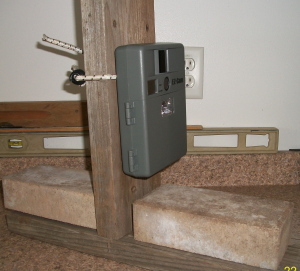 Make sure the time/date stamp is set correctly and affix the camera to a solid object like a tree, or an overturned milk crate. You can also make a simple stand to hold the camera steady, such as the one in the picture above. They will give you motivation and hope to continue. Your lost dog is there. You have the proof in the pictures. He is depending on you to safely bring him home. Click here to go to Part 8. 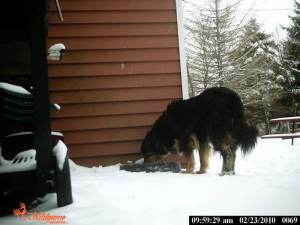 Feeding Station, Recovery Procedures, Shy Lost Dog Series, Shy Lost Dog Strategies, Trail Cameras camera, shy dogs, tracking, tracks, trail cam. permalink.